Unusual Features: Having both a spirit talisman and a the ability to shape change, Tiernia's physical form is not necessarily consistent from day to day. When in her "high" or augmented state, Tiernia becomes larger and has a denser body mass. 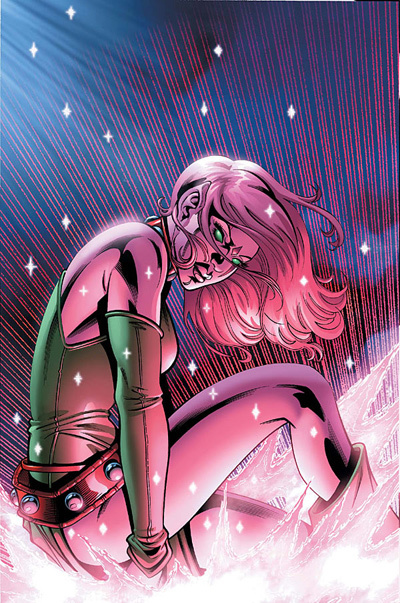 At one point in her life, Tiernia had gems enfleshed in her body known as matrix stones. These items are old Kriar technology. While she wore them Tiernia could fly and had greatly increased healing. She has since been forced to remove them because of undesirable changes they were having on her body. Group Affiliations: Protectorate, Kel'Ishtauri Bard schools, Nirvanae Academies, The All-worlds Thieves Guild, The Dream Merchants. 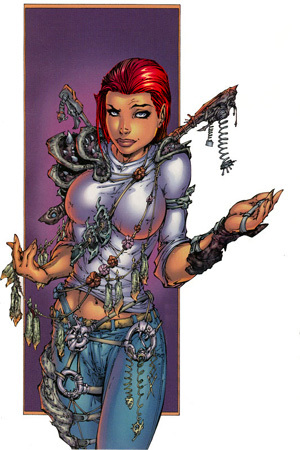 Magical Skills: Tiernia possessed numerous magical powers, many as a result of her spirit talisman. As a bard she has many various magical odd bits at her command. Tournament Rank: Tiernia does not compete in regular tournament play. However, at the peak of her career, Tiernia defeated some of the most dangerous creatures in the Ring Realms. With her augmentations and magic items in use, Tiernia could easily compete in unlimited class tournament competition. Information: Tiernia has a long and sordid history. She is at the root of many problems that cropped up in the Ring Realms and also part of many of the solutions. A drinking and adventuring companion of Damrosil Terranath, the two of them in raised hell through the lands surrounding Grayhawk. She survived the drow invasion of Grayhawk, and confronted the spider goddess Lolth. She has worked both for and against the Dream Merchants, and has been a part of and enemy of the All-world's Guild of Thieves. Tiernia is credited with recovering the Shaladen blade Stellaraac. She was invited to join the Shael Dal shortly after Damrosil Terranath became a member of the protectorate. Tiernia declined the offer-- however, she was not allowed to keep the Shaladen. In return for the sword, the Eternals gave her the ability to shape change at will. Height: O:5'3" A1: 6'2" A2:5'11" A3:7'6" A4:6'4"
Unusual Features: Daena has become in every essence a "first one" (or as has been noted a "second one" because she is that actual incarnation that the first race designed. She has numerous immortal features shared in common with the pantheon lords. Her tissue (in normal form) is three times denser than human flesh giving her commensurately greater strength and resistance to injury. Her eyes glow with the energies of Eternity and her body crackles and shimmers with magical power (unless she suppresses this aura [which she typically does]). Magical Skills: As the first ascendant after eons, Daena has a vast array of magic-like abilities, most of which she is unaware of. With Janai T'Evagduran's help she is exploring these powers and discovering more and more each day. One Daena's major magical abilities is the power to alter her shape. Currently, Daena has only used this power to adjust her height, weight, proportions and mass (and make alterations in hair, eye, and skin color). She has demonstrated the ability to look like other people, so there is nothing that precludes her using it to become other creatures. The other application of Daena shape altering power is what is called "battle-shape" where the tissue of the body takes on a "metalized" state. In this form, an ascendant (and pantheon lords who also possess this ability) are resistant to nearly all forms of conventional injury. The organs of the body go into a form of stasis and even deep penetrations into the metal shell have limited effect (a stab through the heart for instance will not kill an ascendant in battleform-- though when they change back to flesh and blood the injury might do so.) Ascendants cannot naturally heal or by healed by either magical or technical means while in battleform. The battleform is extremely inconvenient. While the user is incredibly strong (usually able to lift ten tons or more), it takes a great deal of energy, the body is inflexible, has no feeling and is very slow. Because of the great mass (the user typically weighs a few tons or more), most floors and furniture will not support a person in battleform. Battleform cannot be retained while asleep (or at least nobody in the stories has figured out how to do it yet). Another of Daena's commonly used magical powers is her stealth ability. She can turn her aura and the auras of other creatures "inside out". Even creatures as powerful as the eternals have difficulty seeing magic and energies hidden in this fashion. The nature of this ability and how she does it is still a subject of discussions amongst the many magic-wise people who know Daena. Spirit speak and telepathy are two other innate abilities that come from Daena's rebirth as an ascendant. Spirit speak is another power shared by the pantheon lords though Daena seems to possess a stronger form of it. This ability allows her to speak any language she is exposed to. This operates independent of Daena's desires. When she speaks people hear her voice in their native and most fluent language. The translations are as idiomatically correct as possible. By this same token, Daena hears people speak in their own language but the meaning (including idiomatic phraseology) remain clear to her. Daena also possesses the far more versatile and powerful ability to communicate telepathically, though she does not use this talent often. As mentioned earlier, Daena has many as yet unknown powers that stem from her rebirth as an ascendant. Her potential as a magic user is phenomenal. This was proven by Janai's ability to teach Daena how to perform teleportation. After learning this skill, Daena can now teleport by force of will alone, much the same way Kriar and other planes savvy creatures can. Daena's last abilities stems from her heritage as a savant (Da'Jamack Nola). Her nola powers were vastly increased by her ascendancy. Daena has the ability to control magnetic and gravimetric fields. She can manipulate metals, reshape them and move them with her mind. Daena's most devastating nola power is her ability to do "gravimetric isolation" which causes a target to stop in relation to the proper motions of the planetary and stellar bodies near which the object resides. By doing so, the object suddenly gets "left behind" the achieved affect being an angular velocity that can be in excess of a mile a second or more. Daena has no control over which way the object will "fly" when it is isolated, so there is always the risk the attack might be just as devastating to her or any nearby allies when it is used as the object or person scorches off in a particular direction. ((Daena and Wren discovered that by working their nolas together that they roughly affect the direction the object flew when affected.)) Like most savants, Daena can leave her body and astrally travel. However, Daena's astral form is near infinite in its range and strength. She is likely the most astrally powerful creature in the realms. Tournament Rank: Daena is not yet old enough (or particularly interested) in participating in tournament play. She is an untrained combatant and any skills in fighting she possesses are remnants of Hella's memory. Hella, the daughter of Loki and the goddess of the dead who joined with Daena possessed significant fighting skills as do most of the Aesir. Daena's great strength, speed, and resistance to injury make her a dangerous opponent for unskilled fighters. However, she is little threat to higher ranked warriors. Information: Through a course of events detailed in 'Neath Odin's Eye, Bannor Starfist located Daena for Hella, the Aesir goddess of the Dead. Hella had gotten tired of her static existence (and tired of listening to the bellicose bluster of the other Aesir if any credence can be given to her statements). When confronted with the potential escape of Wren Kergatha, her parents, the De'Falcones, and the T'Evagdurans from Nifelheim, Hella offered to let them go without pursuit in return for Bannor staying with her of his own free will. Bannor agreed. Later, Hella requested that Bannor find her alpha half-- her tao match. Bannor did so and he led the powerful goddess to the planet of Crownar (The central world of the 27th magocracy) where they soon after found Daena. Hella tried to persuade Daena to accept the merger but the young girl (then only 15) was far too frightened to willingly acquiesce. Hella then forced the transformation wherein Daena became an ascendant and heir to the vast powers of Gaea's first children. Overwhelmed and frightened by the change, Daena latches onto Bannor and follows him back to Gladshiem and conflict with Odin and the High Jury. It is in Gladshiem that Daena meets the beaten and frozen Janai T'Evagduran fresh from a long imprisonment in Hella's dungeon. Janai immediately latches onto the young girl and the wily elf noble quickly gets into Daena's good graces. After returning from Gladshiem, Janai immediately adopts Daena as her "ward prodigal". A few scoredays into their relationship, Janai declares Daena to be her "One". Declaring a person to be a "One" implies monogamous relationship between two people. The implication can be romantic (as it is with Bannor and Sarai) or it can be platonic as suggested in the situation between two females. Because Daena is a shape-changer the romantic / platonic aspects of this are somewhat more murky. During the course of her ascendancy, Daena's "natural" or base form goes through several changes. When she first becomes an ascendant, her body is roughly in the configuration that Hella was last in (as noted in the height and weight under A1). She later with help from others adopts a slightly smaller and lighter form that becomes her new "native" body for living in. Later during the course of events in Gaea's legacy, Kell purifies her tao and synchronizes her with the magic of Starholme Prime. This transformation causes an explosion in her size and weight (as noted in A3). At this point Daena's personal energy is so great than it is difficult for her to assume a smaller shape. She manages to squeeze down to what becomes her native size (A4) for the rest of her depictions in Realms literature.